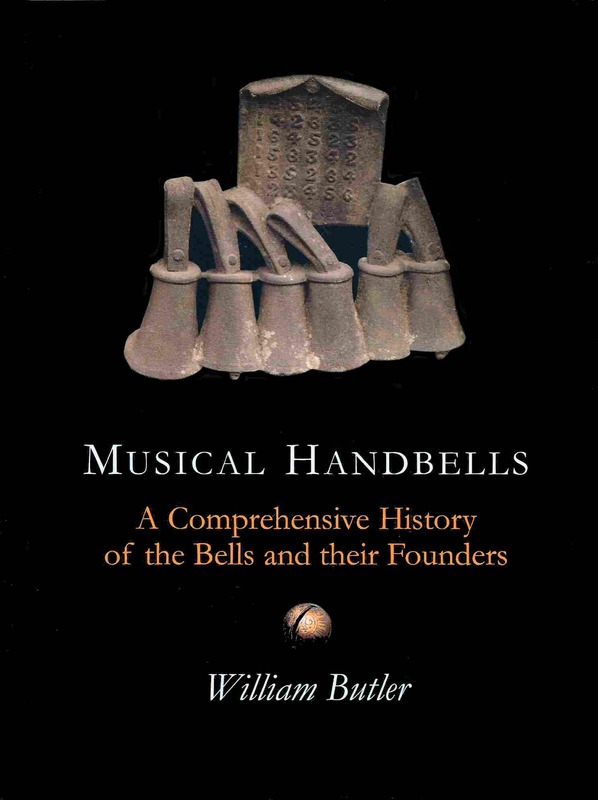 In 2000, Bill Butler wrote Musical Handbells, a comprehensive survey of the history of handbells and founders in Britain. The publisher’s note is reproduced below. Nearly forty years ago William Butler became intrigued with a set of handbells he discovered in an antique shop. He made some enquiries of friends but no one appeared to know anything about their founder. That started him off on this history. Since then he has devoted many hours travelling around the country making notes on handbells in churches, museums, private collections and even bells in antique arcades. His background as an analytical chemist has assisted in this detective work and can be seen in the meticulous accuracy and detail of the references to each chapter. The first few chapters deal with small bells in general and the development of pattern-cast bells by John and Oliver Cor at Aldbourne in the last quarter of the seventeenth century. A long chapter deals with the ten handbell founders from this family and gives full-size illustrations of their founders’ marks. The use of their bells by ringers for practising change ringing and tune ringing led to the devising of new types of fittings which other bell founders copied and improved. Other chapters deal with the major foundries at Whitechapel, Loughborough, Bradford and Cripplegate. The smaller foundries like those of Henry Symondson, William Dunn, William Pawson and many others also receive full attention. Altogether one hundred and eighteen founders are discussed and traced in the text. Where known, those who also made crotals are included. Nearly two hundred and fifty figures illustrate every aspect of the text. The nine appendices cover such diverse subjects as a systematic method of identifying handbells, a chronological list of founders and the most comprehensive bibliography of handbell books yet published. If you have any interest at all in handbells, you cannot afford to be without this book! This hard-backed book of 162 pages is published by Phillimore and contains hundreds of photos and illustration of handbells and founders marks, the founders themselves and their adverts. Appendices cover how to identify founders of handbells, how prices have changed and a comprehensive list of founders from 1670. Available for £20 post free by e-mailing Bill Butler – bill@barfield.org.uk. It makes an ideal present! So far, nine addenda have been written to update the book. You can download each of them here for free.